First and foremost, Jazakamullahu Khayran to all of our generous brothers and sisters who have and are helping with the dawah at CICT. We ask you to help us in raising awareness of true Islam, spread the sunnah and provide more social events and services for the community far and wide inshaAllah. 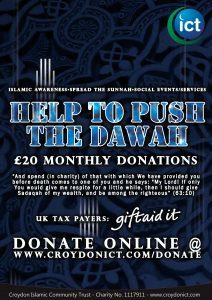 If you are a UK tax payer please select giftaid it to make your donations go that little bit further inshaAllah. This entry was posted in News and tagged Ahlus Sunnah, As Salafiyah, Dawah, Masjid, sunah by Admin. Bookmark the permalink.